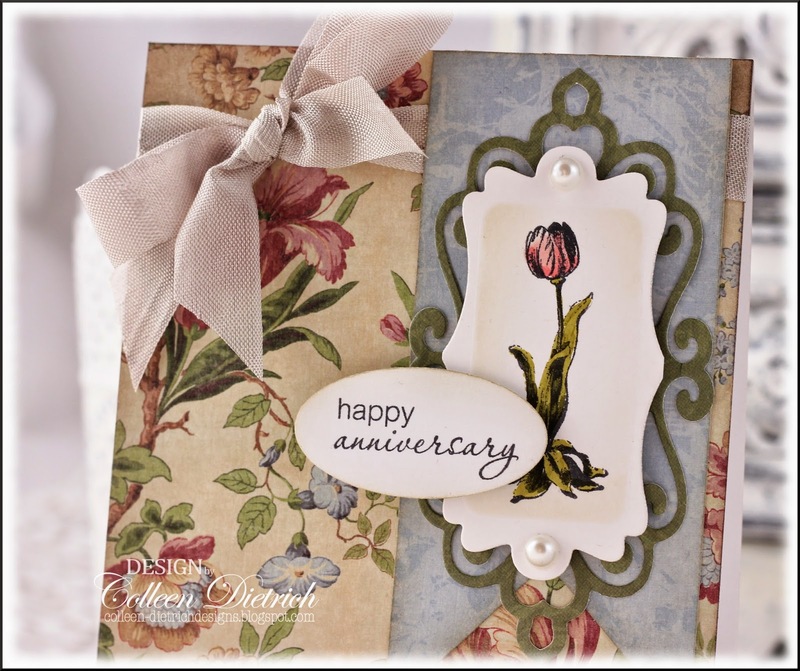 Some retired Stampin' Up! 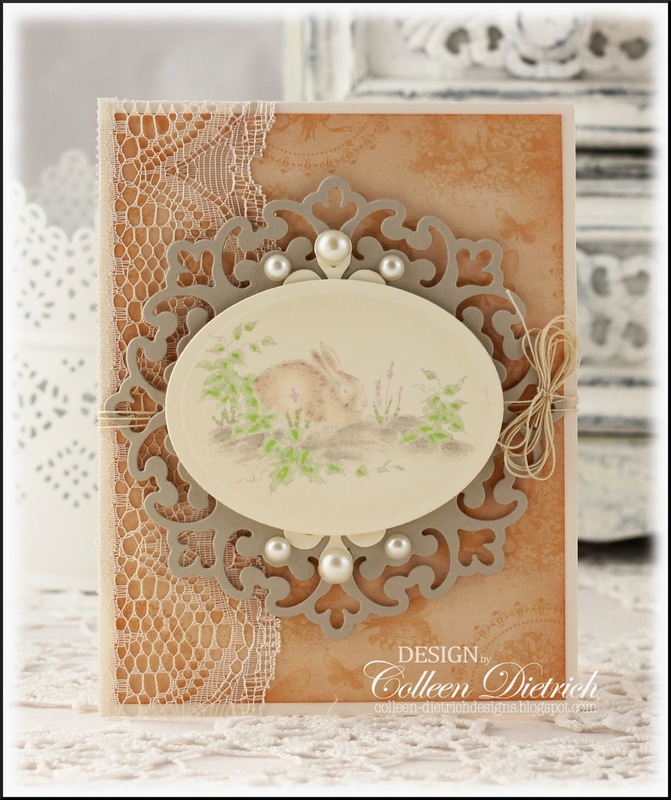 patterned paper made short work of this card, which features a beautiful pairing of die cuts from Spellbinders' Laurel and Bee. 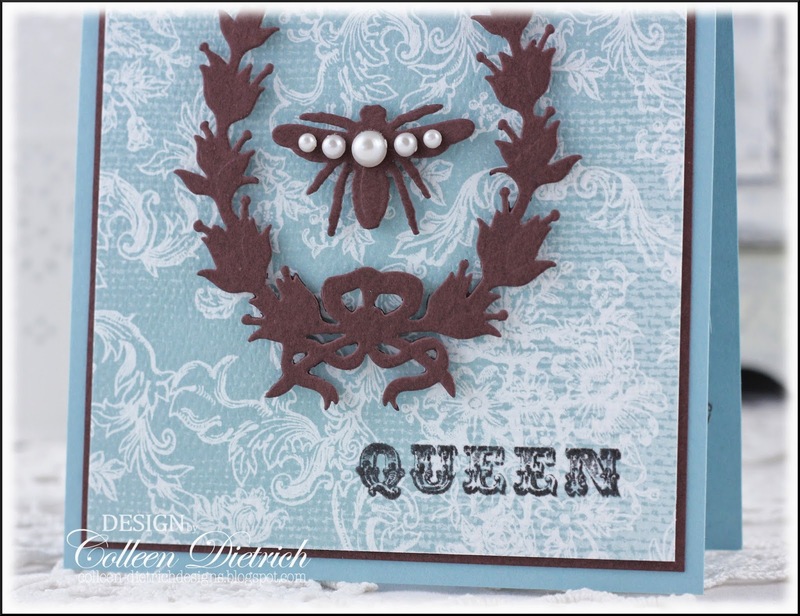 I added some pearls to the bee, and a sentiment from Pink Paislee's Queen Bee (what else?!). This card was fun to make, and I've already delivered it to Arts Plus Gallery. Hope someone decides this is perfect for his/her own mother! 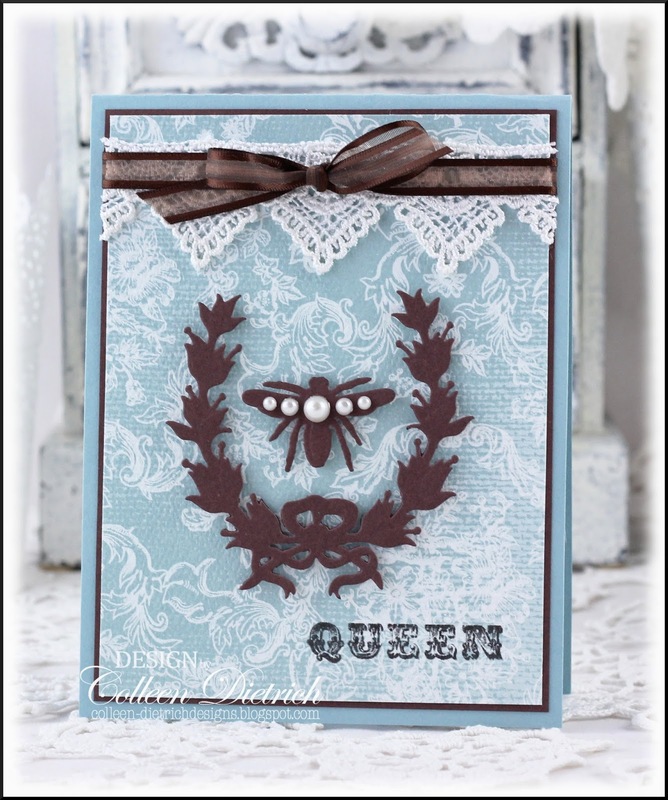 Stamps: Queen Bee - Pink Paislee Paper: Baja Breeze, Chocolate Chip, Bella Toile pattern - SU Ink: Versafine Onyx Black - Tsukineko Fibers: sheer chocolate ribbon - Offray; Venise lace - eBay Accessories & Tools: Laurel & Bee dies - Spellbinders; pearls - Queen & Co.
Can you tell what the boo-boo is? 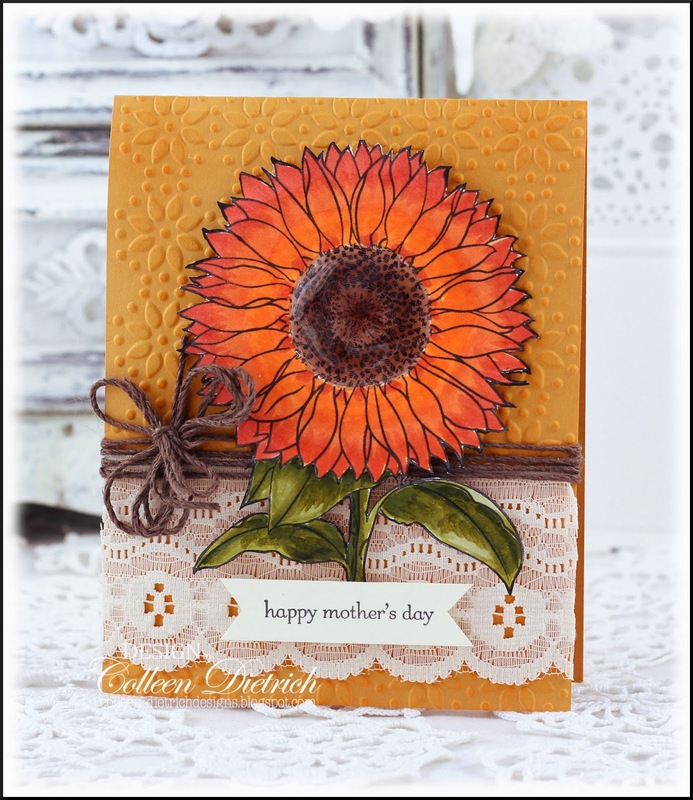 The sunflower comes from Inspired By Stamping's French Country set. After coloring and trimming it, I used a black marker to run along the edges as best I could. Don't want to see the white edges! Then, I added a glossy center after adhering to the card base. The flower stamp has a short stem, and I do wish it could be longer. To hide the shortcoming (oh, pardon that pun! 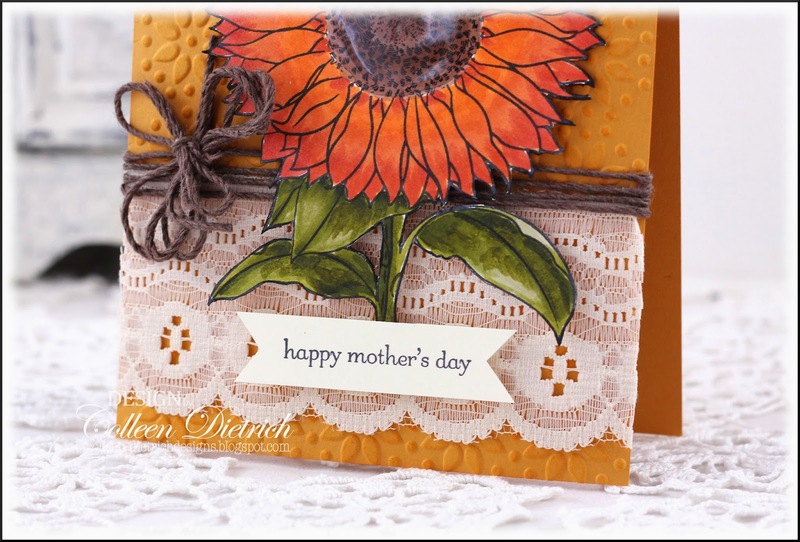 ), I stamped a Stampin' Up! sentiment from Teeny Tiny Wishes on a hand-cut banner and hid the stem. I'm so glad you could drop by today! 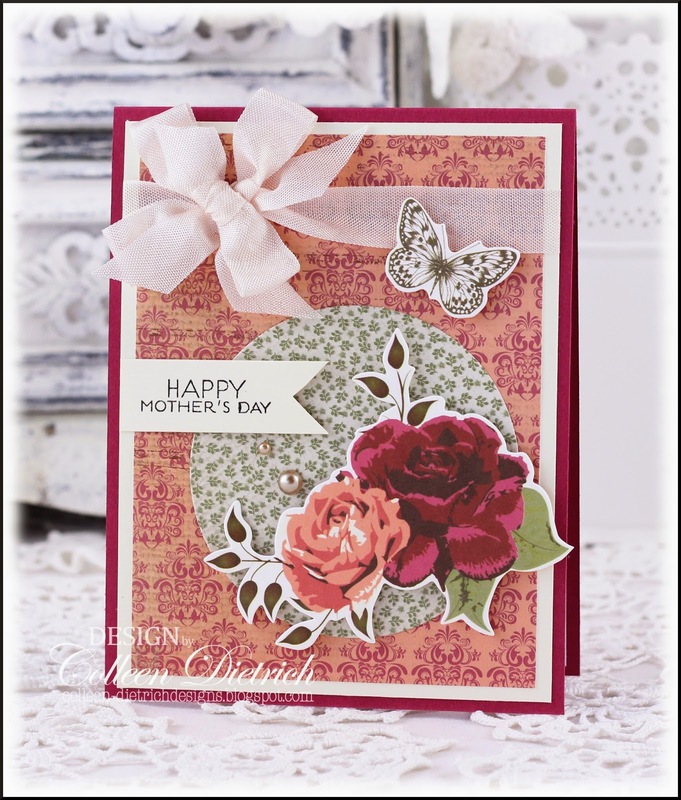 I'll be back soon with more cards for Mother's Day. My 'Bits & Pieces' box helped me once again, this time with a pretty tulip image from Anna Griffin. It had been stamped on a bit of cardstock and colored, and then waited a long time for me to put it to use. A Grommet Tags die from Spellbinders fit it perfectly. I layered another die cut underneath, from Fancy Tags Two. All patterned papers come from K & Co.'s Julianne stack. They are so traditional and elegant, and really appeal to me. For years, I only had one Papertrey Ink stamp set (Wonderfully Whimsical), and always held off getting more because I thought they were too expensive. Well, that's all behind me now - hee hee - and I have really stocked up! 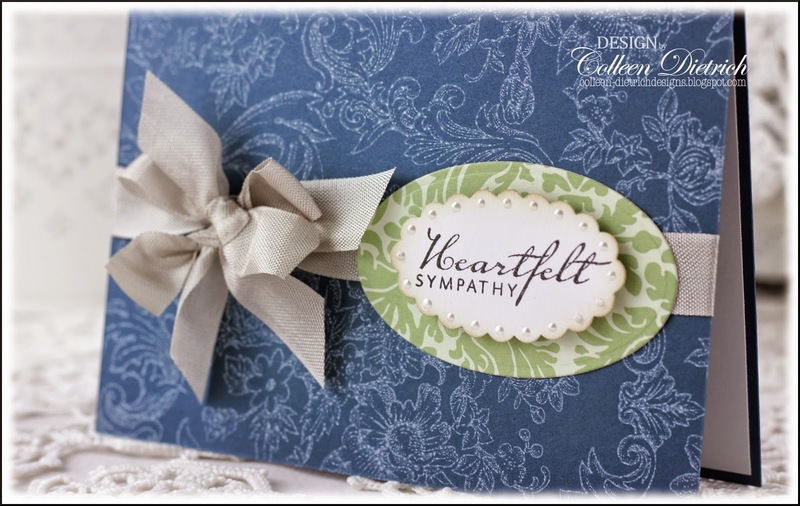 LOL The sentiment here comes from Daily Designs Sentiments....a SUPER-essential set, in my opinion. 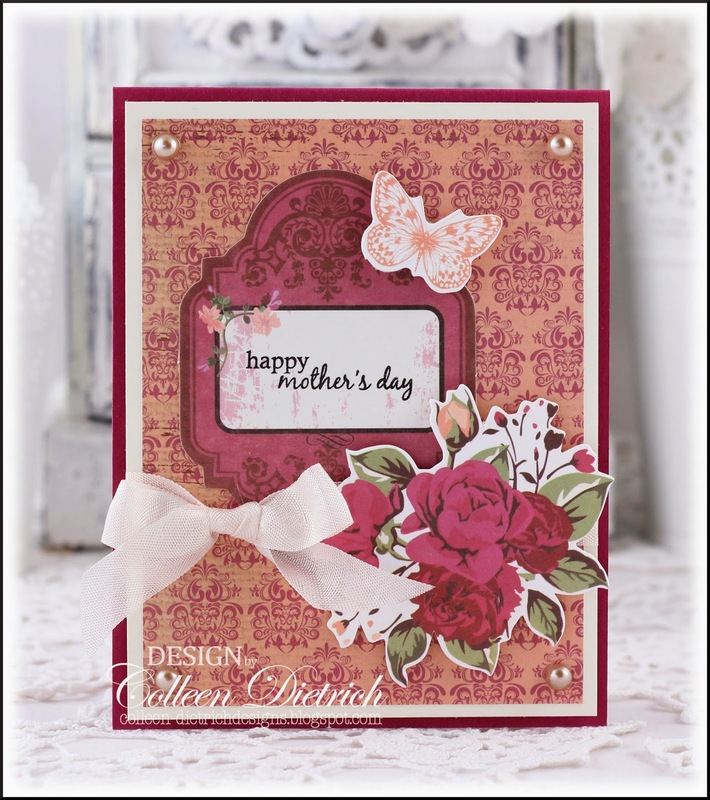 Can't wait to show you some Mother's Day cards later this week, so I'll see you soon. Thanks so much for coming by today. One of my birthday gifts was Summer Hills stamp set by Papertrey Ink. Love, love, love. This sweet little scene stole my heart. 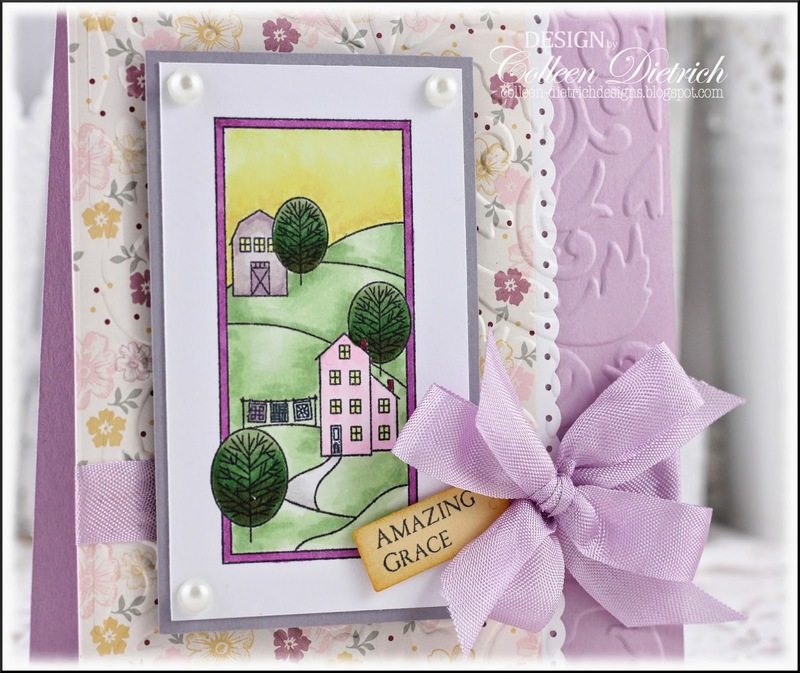 To create the base beneath the scene, I adhered a pretty floral pattern from Stampin' Up! (retired, no idea what the name is) and a strip of scalloped punched white cardstock to the plum base. 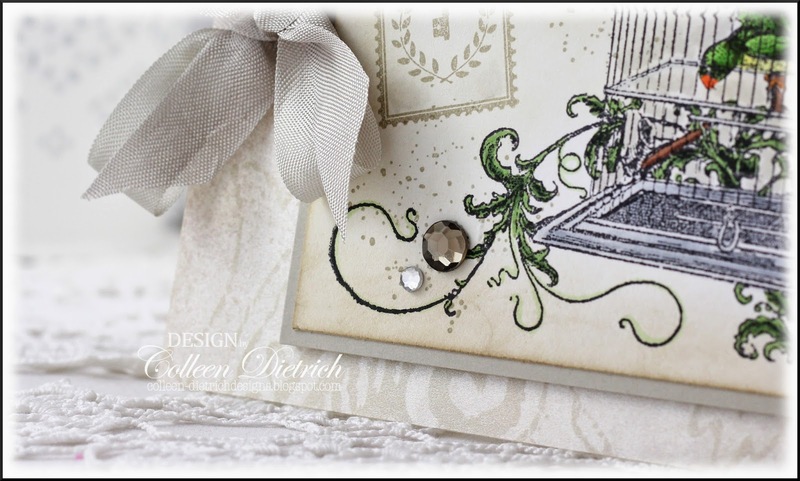 Then, I sent it through the Big Shot with a Paper Studio embossing folder, Ornate Flourish. 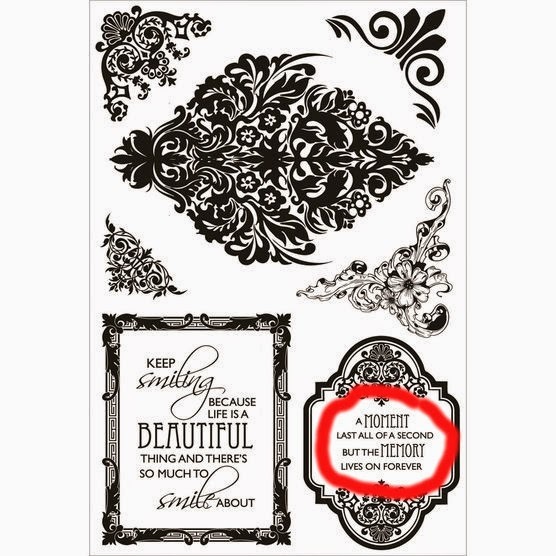 The sentiment comes with the same stamp set, and there are boundless occasions this card could be used for. God's grace is truly amazing! Hello everyone! 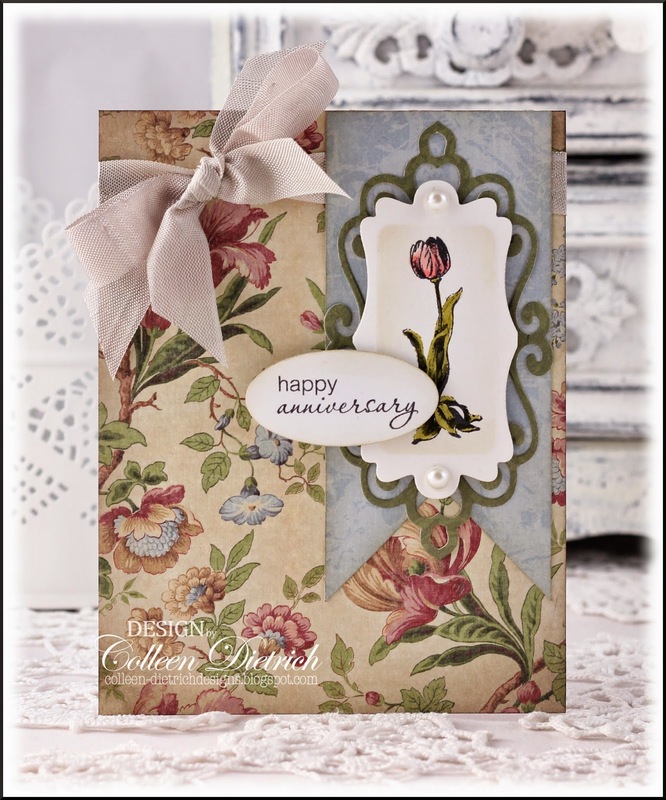 The rustiness I felt with card-making is gone, eased away by a stretch of vacation days (well, not really vacation...but rather just some time off). 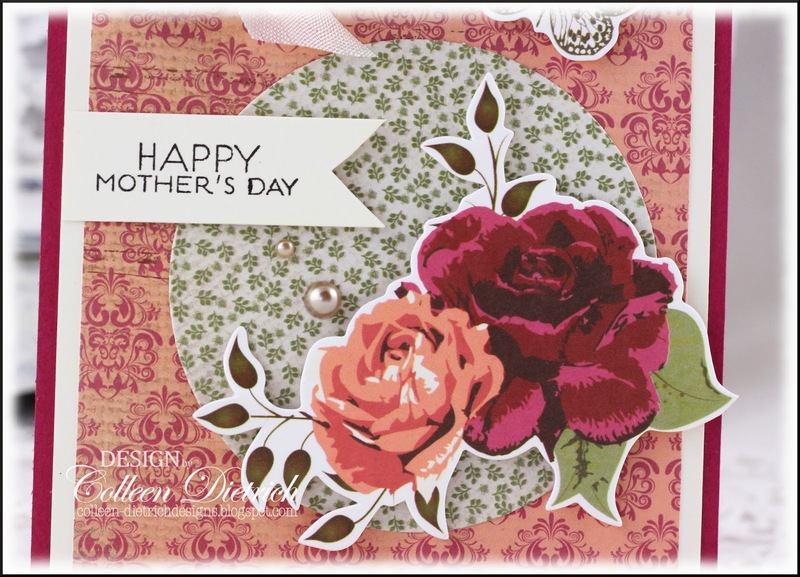 I have been in the craft studio quite a bit, mostly making Mother's Day cards for the shop. This card, however, is a 'just because' project. It started with a piece from my Bits & Pieces box...this large Victorian birdcage (from Victorian Eccentricities by Blockheads Paper Arts, which is sadly no longer available). A few years back, when I served on the Blockheads team, I had stamped the image on white cardstock, then cast it aside. It stumped me for a good, long while. 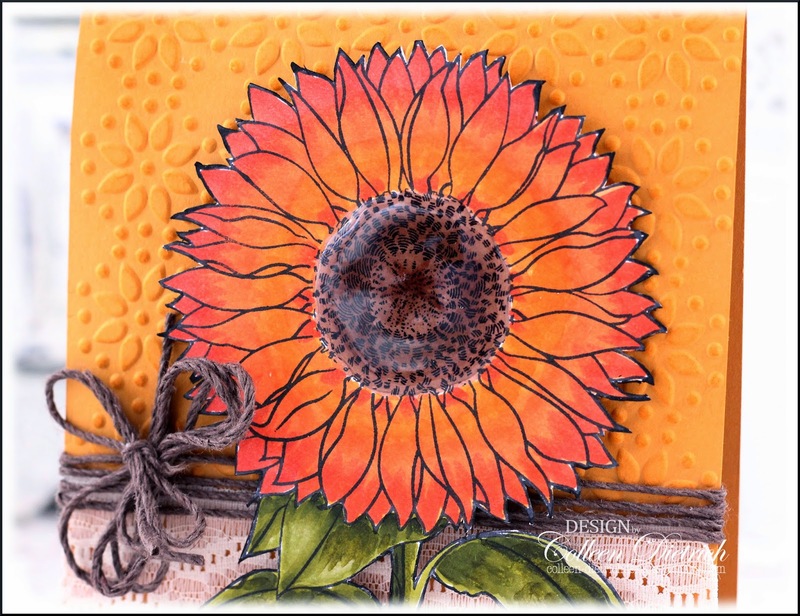 I decided to turn this into a postcard by using the Inspired By Stamping sets, Vintage Postcards and Summer Postcard Add-On. 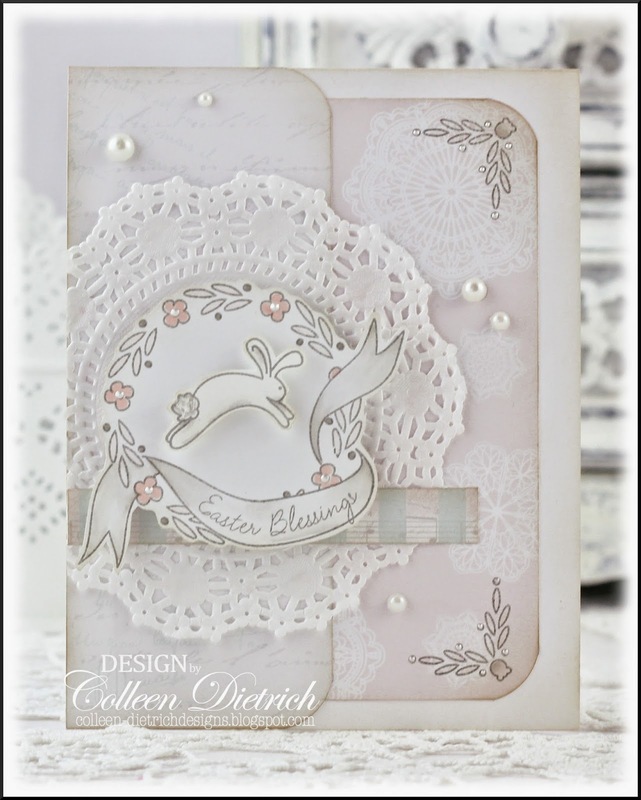 And since it still looked too clean, I added speckles from Itty Bitty Backgrounds (Stampin' Up!). That's a keeper of a set! Hope you all had a Happy Easter! We had glorious weather here in NJ. Temps were in the 70s, with plenty of sunshine. 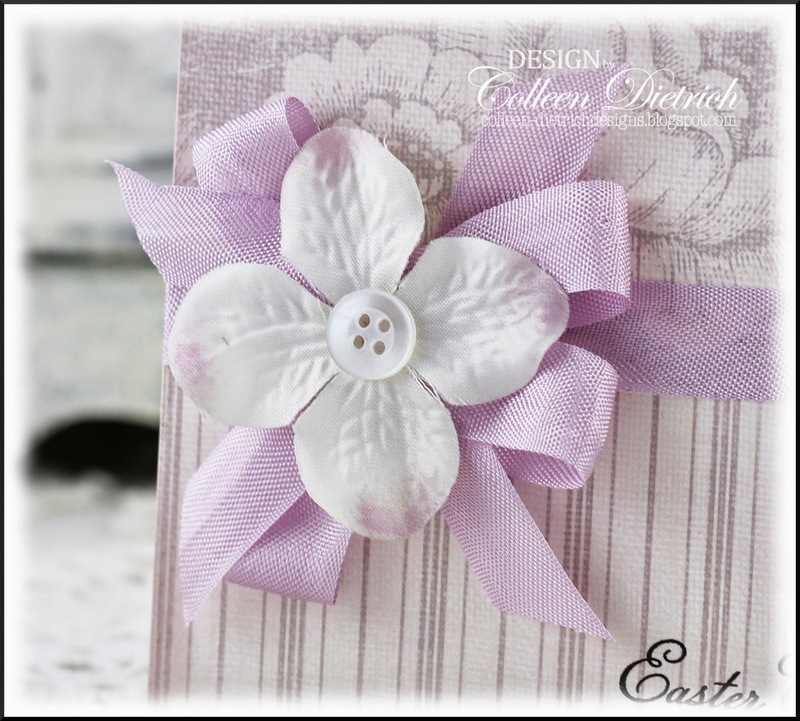 Great for an egg hunt! Don't these colors remind you of sunny days? They are so cheerful! 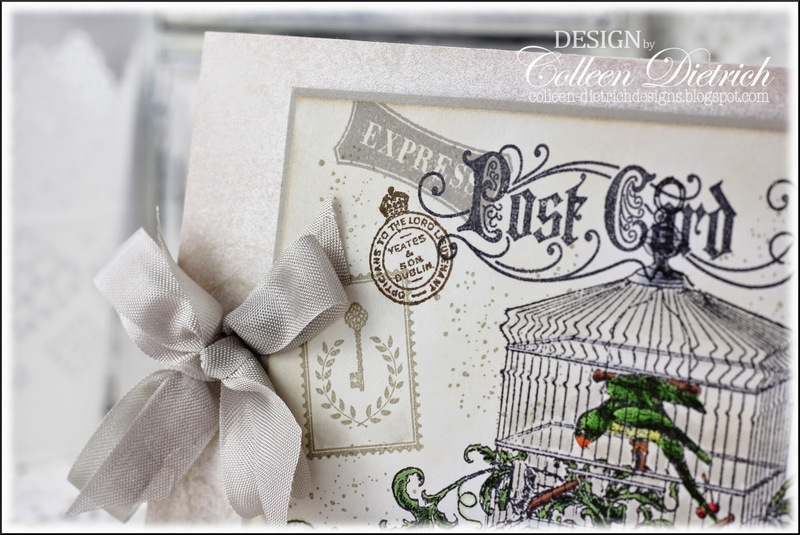 I took full advantage of some beautiful (retired) papers from Stampin' Up!, and added a birdcage from the set, Happy Moments. 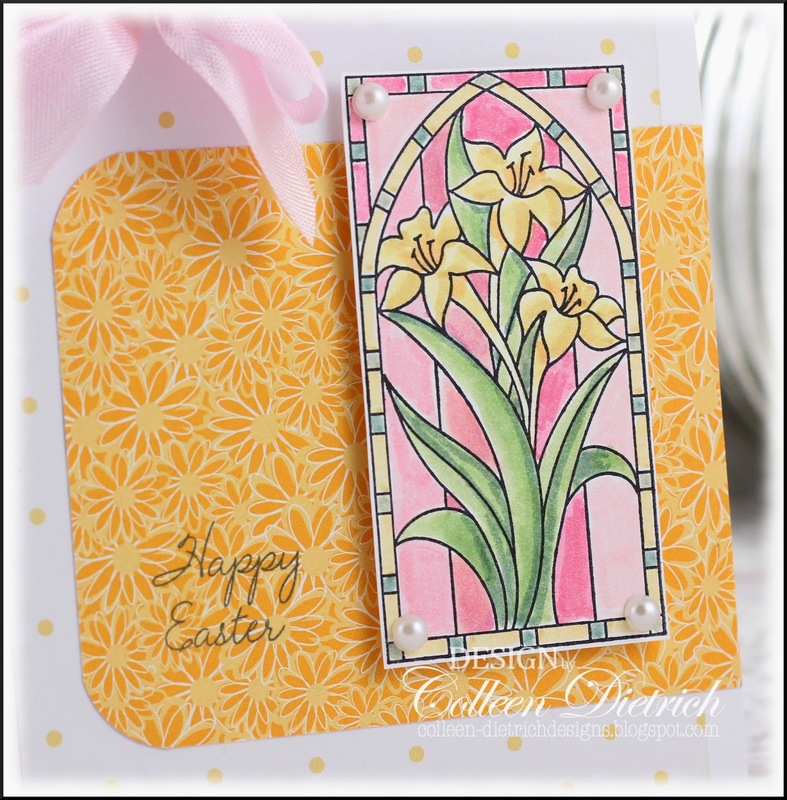 After stamping, I sponged on yellow and rose inks to create a glow. 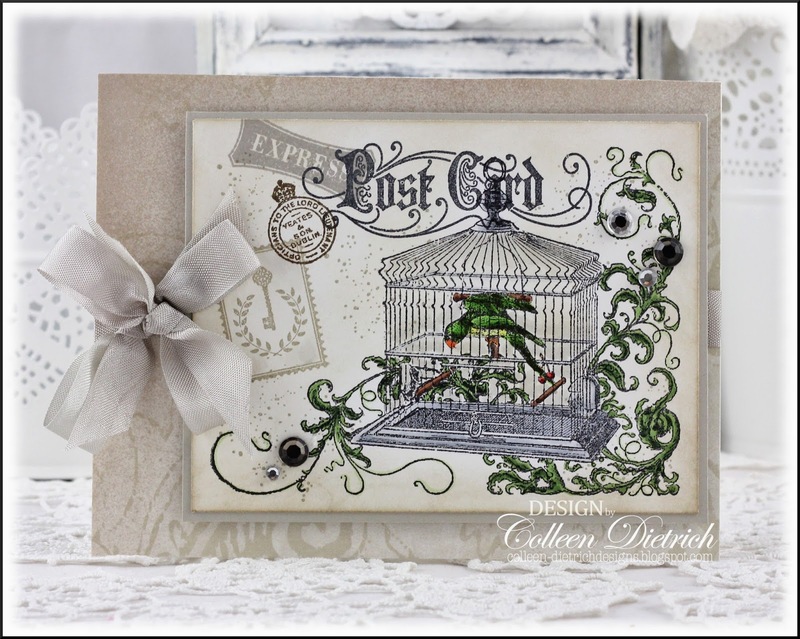 Also on both cards, I stamped a flourish from Verve's Blessings near the bird cages and further down to fill 'empty' areas. 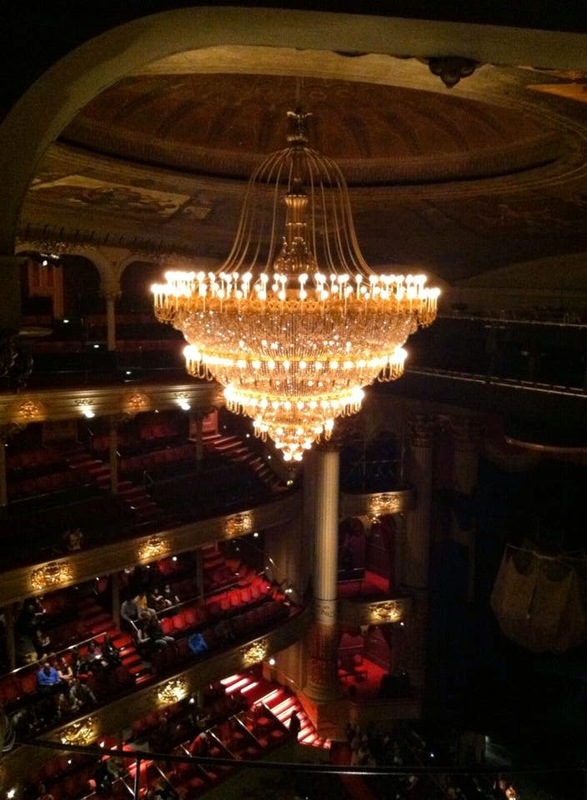 My family and I saw The Phantom Of The Opera at the Academy of Music in Philadelphia recently. It was the first time for all of us. It was a neat experience. To avoid high costs, we bought tickets in the 'nosebleed' section. 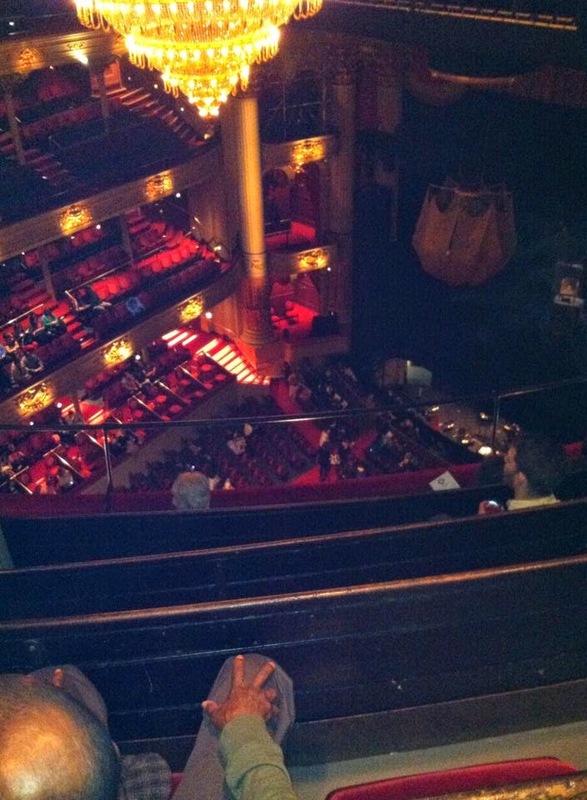 Now, I have a bit of a fear of heights in certain circumstances. The top section, right near the ceiling as you can see here, is VERY steep. I admit to having a small panic attack there! We weren't allowed to take pictures during the show, but my phone's camera wouldn't have done justice anyway. 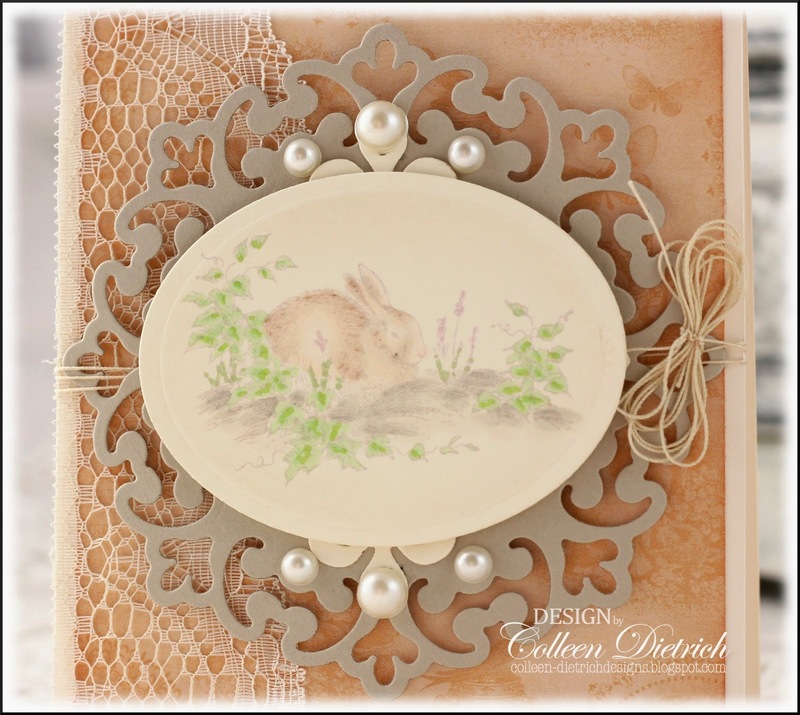 Bella Toile background stamp (Stampin' Up!) is one of those treasures I'll always keep. I stamped it in white on a navy background, and love how it looks. 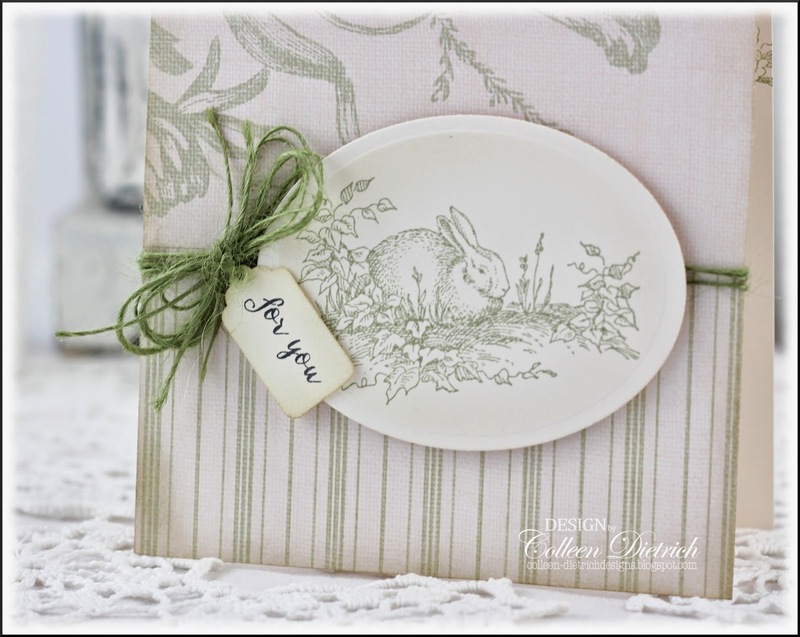 The Verve sentiment (Blessings) was stamped on a scalloped oval, and matted on a piece of a Hallmark card that was just too pretty to throw away. It's got a damask pattern, and I am a sucker for damask. I finished my temp job at an accounting firm the other day. What a wild ride that two months was!! I helped process and assemble tax returns (plus answering phones, making copies, doing the mail, etc. ), and am grateful to have learned a lot. It's good on the ol' resume. That was THE most exhausting job I've ever had, due to the pace. Sooooo glad the kids have their Spring Break this week, so our pace at home is nice and easy. Just what I need! The grand finale of my Easter collection is here. 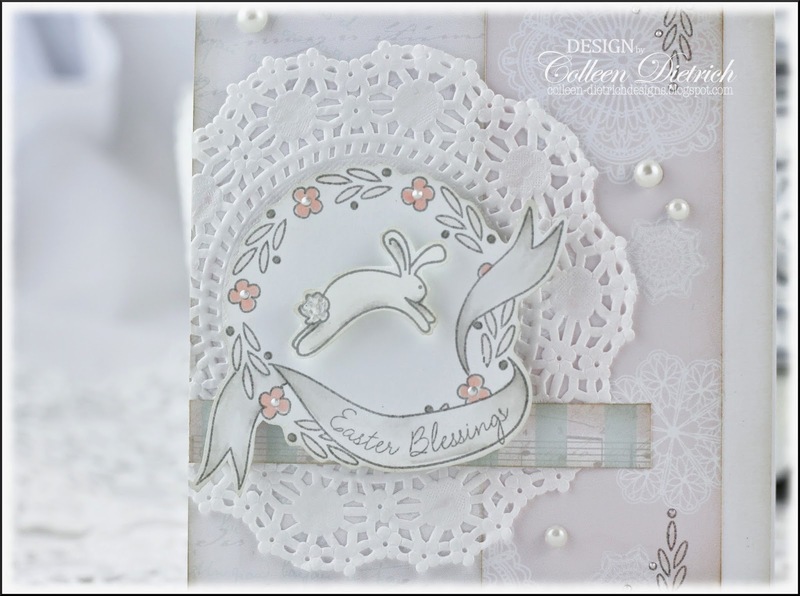 :-) Five cards in this post, and it's been fun sharing Easter all week long with you! 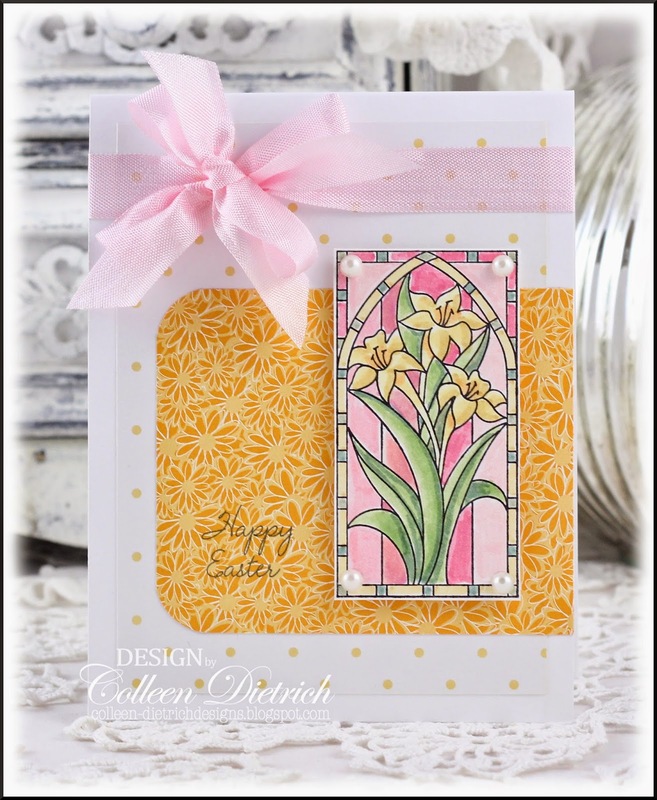 Up first, an oldie-but-goodie stained glass lily stamp from Stampin' Up! I bought it at a garage sale years ago, and it was all by itself, so I'm not sure of the set name. 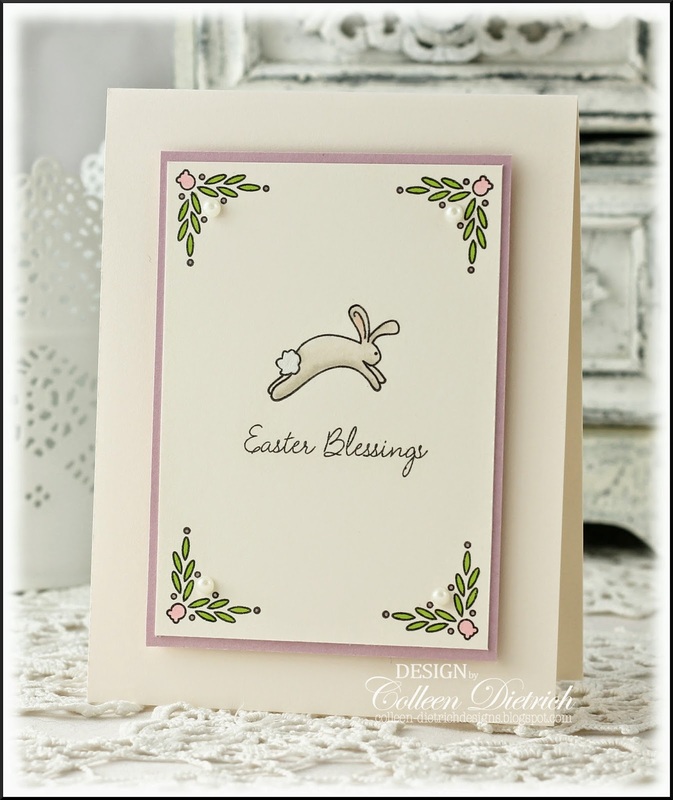 The sentiment is from Wplus9's Easter Blessings set, which has a great assortment of Easter sentiments. 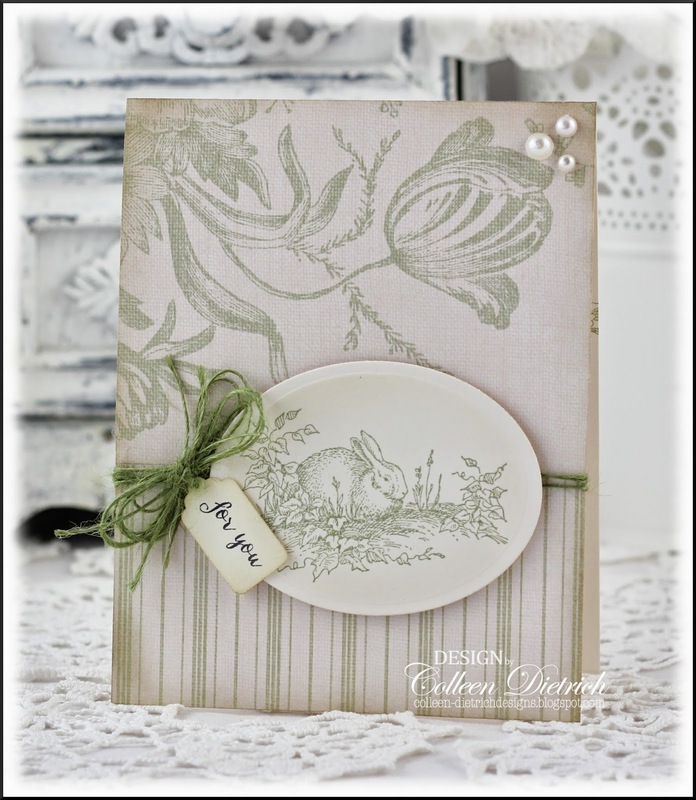 On the rest of the cards, I used the same sweet bunny from SU's Tender Toile set in different variations. 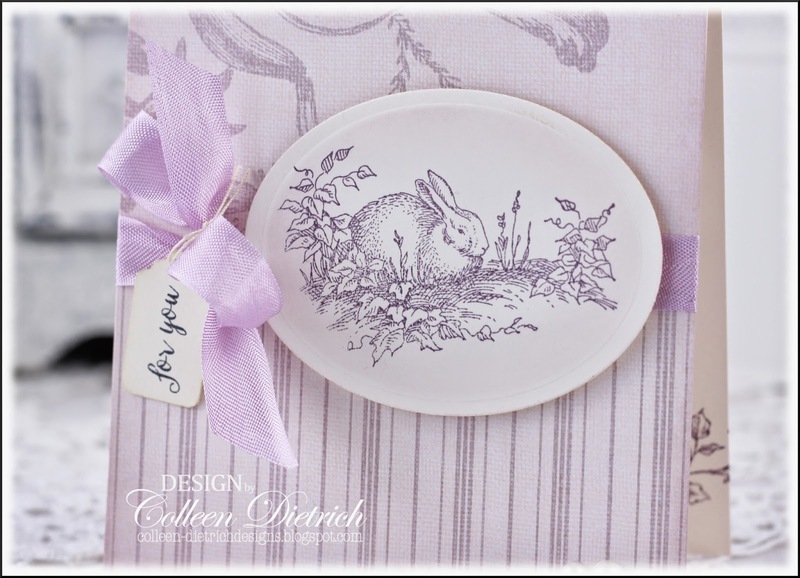 On the next card, I stamped the bunny image in Pale Plum, then used Copic markers to color in. It gives a much different, softer effect than a deeper color of ink would. One of the problems with making a card, then not blogging about it until a good month later, is that you forget the names of things you've used. Like this patterned paper, for instance. I have NO idea which pack it came from. 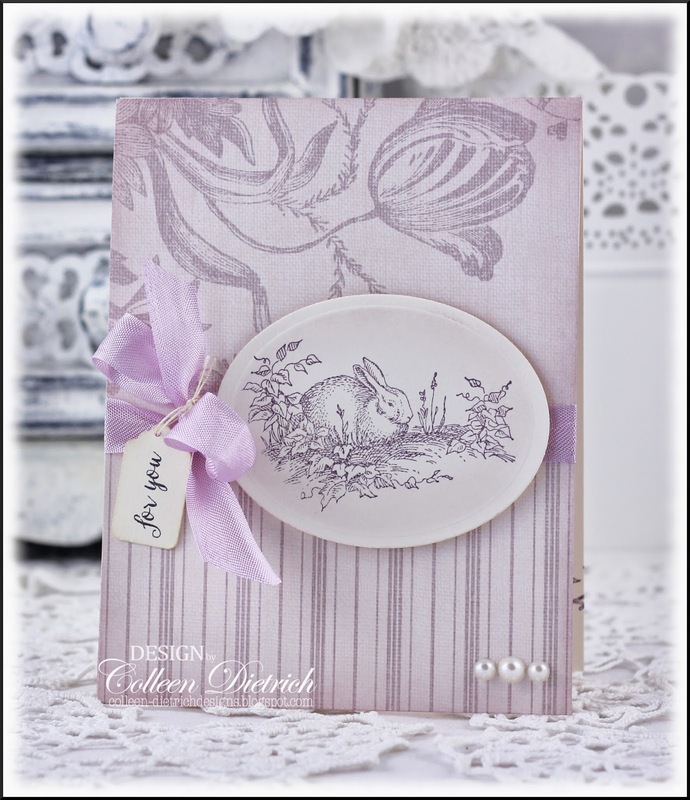 This card is almost identical to the green version up above, but this time done in shades of purple. 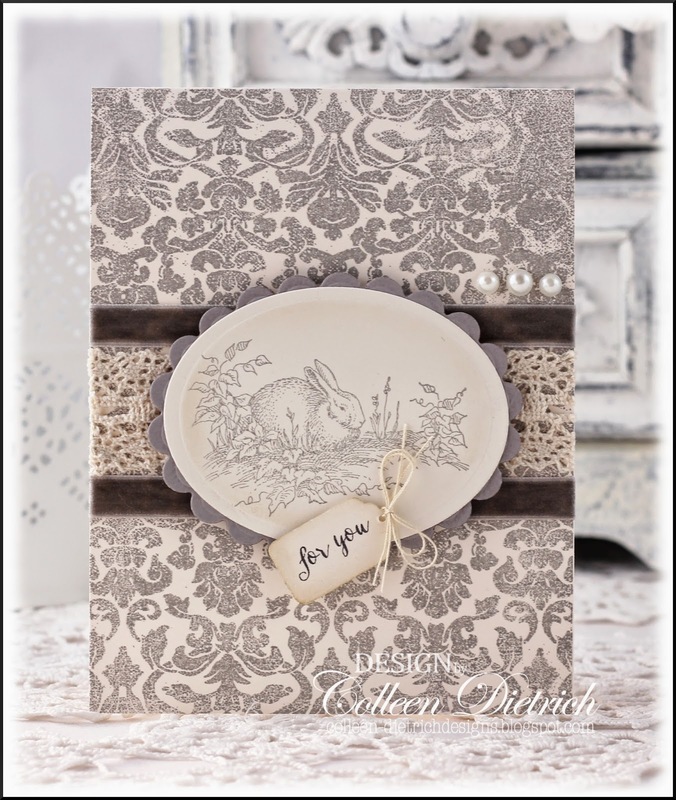 I stamped a cream base with Vintage Wallpaper background (Market Street Stamps) in Going Gray. 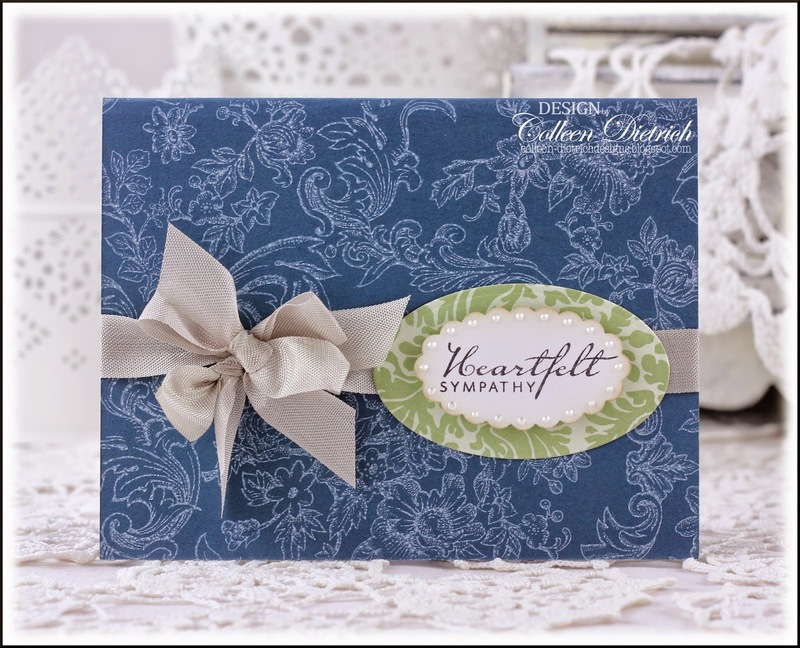 Oh, it makes my heart go pitter-patter with all the damask goodness! I added some cream crochet lace, and gray velvet ribbon by May Arts. I hope you enjoyed the week-long share, and I'll see you soon! Thanks so much for coming by. Used the same set for the next card, but it's soooooo much paler....in fact, it was hard to photograph and photo-edit this one. It looks much too gray in the pics, but in real life it's got touches of very pastel pink throughout. 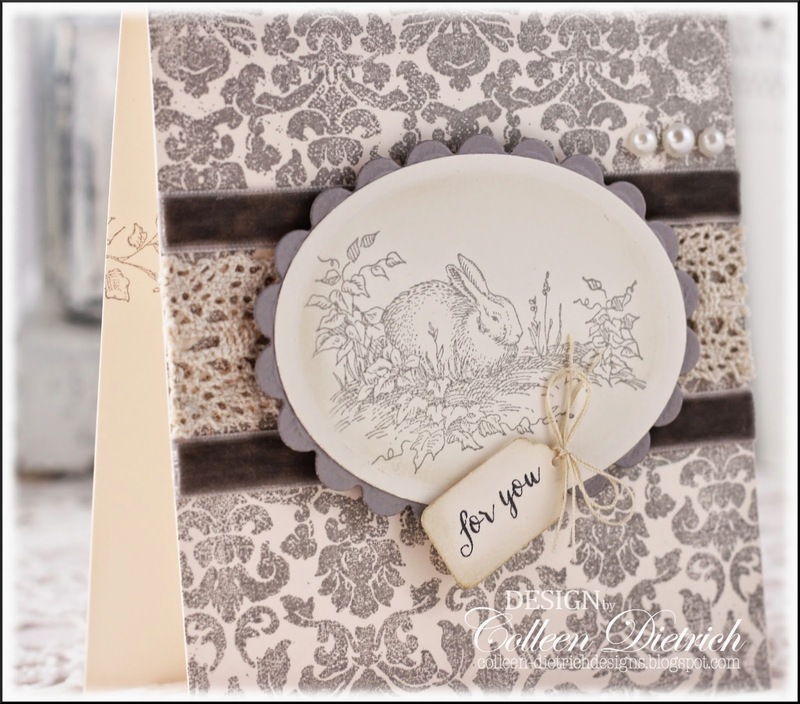 I used pale gray ink to stamp everything, to keep the look soft. The next one is also fairly pale, using patterned papers from K & Co., a sentiment from Stampin' Up!, and more new Hug Snug seam binding. This seam binding is called Violet. I topped it with a flower petal, which had been completely white, but I tipped the edges with a pale plum Copic marker, then added a button. 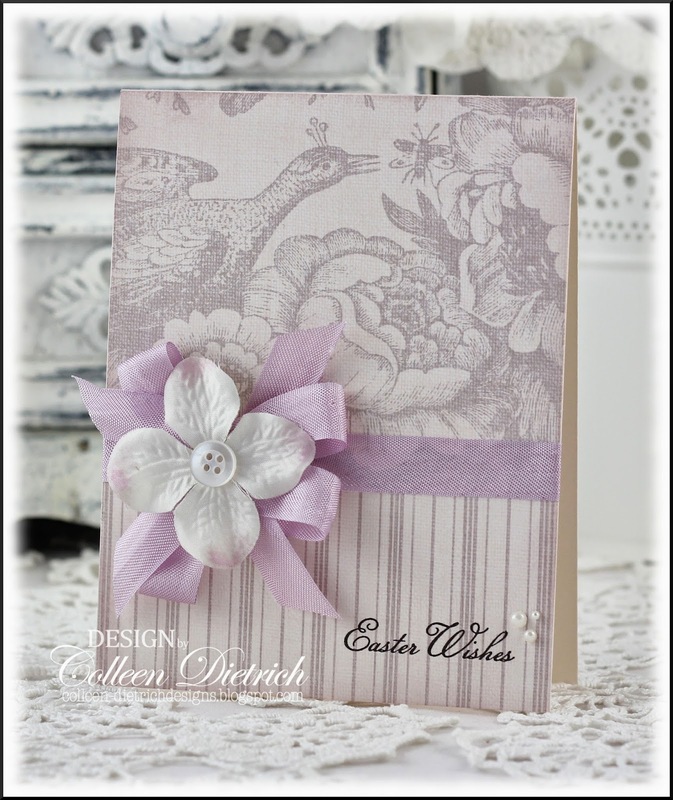 I've got another installment of Easter cards to share....think I'll post it for Friday, then take the weekend off. Hope you have a great day!